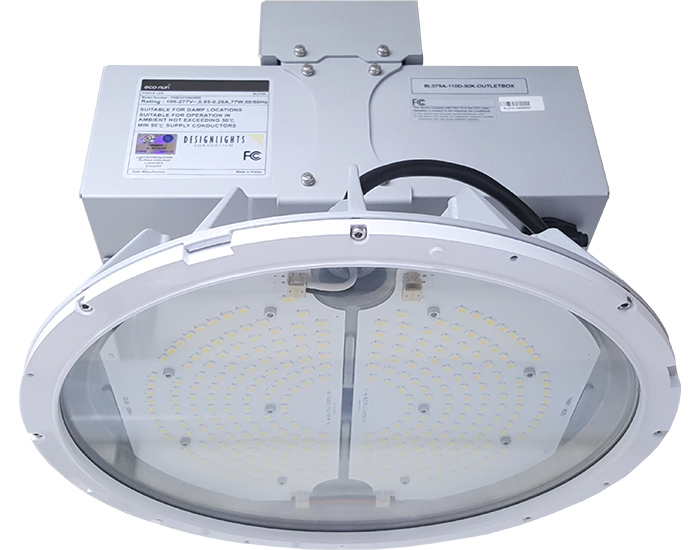 The EcoNuri 75W LED Low Bay is an affordable alternative to metal halide, up to 300W equivalency with upscale design, high-end performance, undeniable value and offers a maximum light output, exceptional illumination, and excellent energy savings. Easy installation saves time and labor cost, providing a virtually maintenance-free service. This strikingly beautiful luminaire combines brilliant aesthetics with space-filling light, all contained within a non-corrosive premium-quality aluminium & shatter-resistant lens. With energy consumption up to 60%, makes this 75W LED Low Bay Luminaire perfect for applications such as food & beverage processing, gymnasium, healthcare facility, retail store, parking structure and more. National Sanitation Foundation (NSF) Certified & Rated Lighting Solutions for Food Processing Environments. NSF International Standard establishes minimum food protection and sanitation requirements for the materials, design, fabrication, construction, and performance of food handling and processing equipment.